I prefer cakey brownies to fudgy brownies. I’ve done Facebook polls and I know that makes me as rare as a unicorn. And, I suppose it’s why I’ve never shared my favorite brownie recipe on Cupcake Project. This cakey brownie recipe is the one that I’ve eaten my whole life. I find its light crumby texture perfect and I don’t mind that it demands an accompanying glass of cool milk. Also, I’m not sure if you can tell, but in another unpopular move for today’s times, I cut my cakey brownies super small. This means that I get to have seconds (and thirds). Why do I love cakey brownies so much? Well, they are my mom’s brownies! She’s the one who taught me about dessert in moderation. From her I learned that a dessert doesn’t need to be over-the-top to be amazing – it can be simply made from scratch with basic ingredients. When I visit my mom, she’s always surprised that I still like her baking now that I bake so much for my career. In truth, though, my mom’s desserts will always be the best desserts. They are the ones that taste like home. While they aren’t over-the-top, her love for me is, and I can taste it in every bite. Love you so much, mom. Happy Mother’s Day! Note to self: Ask Jonathan to get some professional photos of us this year. Somehow when you have a kid, the focus ends up being on getting pictures with the kid. So, we have tons of photos of my mom and Myles, but I couldn’t find a single great one of my mom and me. 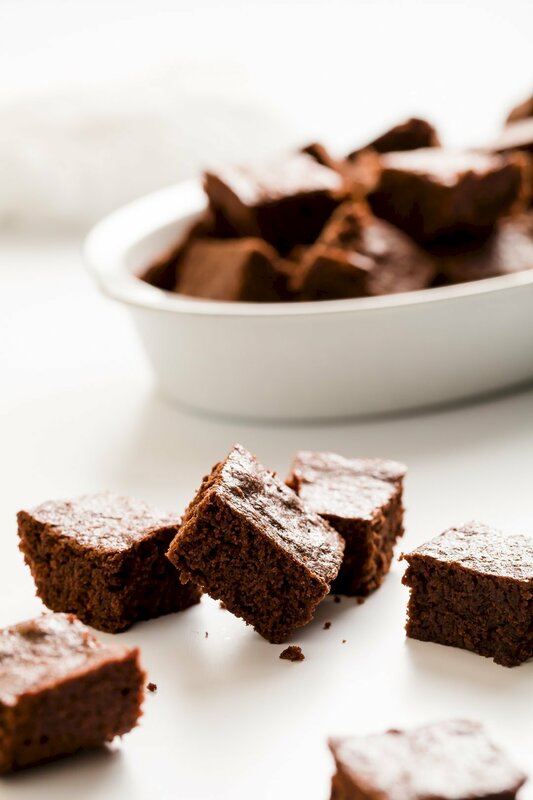 Super easy one bowl cakey brownies! 1/2 cup chopped walnuts optional - I don't typically use them. Put all ingredients into a mixing bowl and beat with a hand mixer (or in the bowl of a stand mixer) until just combined. Transfer batter to a greased 8" square baking dish. Bake for 25 minutes or until a toothpick inserted into the center of the brownies comes out clean. Cool to room temperature and slice into 36 mini brownies. Oh… fine, if you really want a fudgey brownie recipe, I strongly suggest the book Extreme Brownies. I made the brownies from this book one time and everyone went crazy for them. And, if you really do want to make these cakey brownies fancier, you can use them in my cheesecake brownie pie with a pretzel crust. I love the brownies just the way they are, but sometimes, it’s nice to switch things us.